During the Second World War, thousands of Japanese Americans were imprisoned in camps, suspected of forming a fifth column of Japanese soldiers within the US. The vast majority of these people were completely innocent and loyal citizens of the country, but were interned in these camps regardless. This camp housed thousands of people during its 3 years of existence, and illustrates a painful moment of US history. On February 19, 1942, in response to Pearl Harbor and rising anti-Japanese sentiments in the United States, US President Franklin D. Roosevelt signed Executive Order 9066, which allowed the creation of military exclusion zones and to relocate all persons who were to be excluded from such zones. This meant that all Japanese Americans living in places like California were to be forcibly removed from their homes and sent to special camps created throughout the United States. 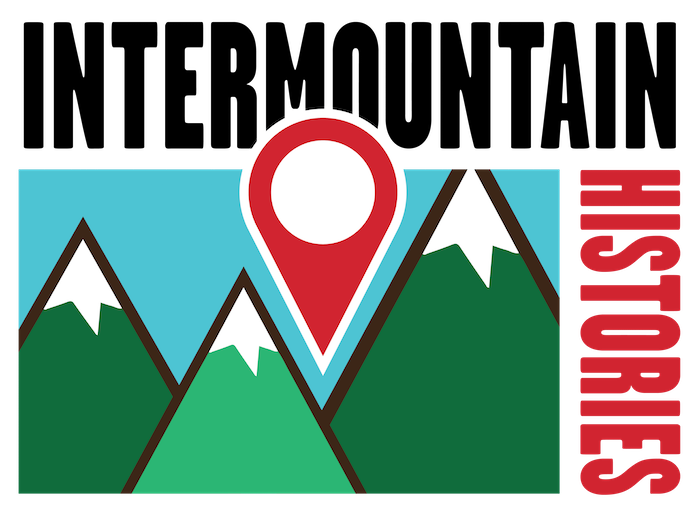 One such camp was created in the middle of Idaho. Named the Minidoka Relocation Center, this camp housed approximately 10,000 people throughout the course of the war. It cost over $5 million to construct. Before being relocated, each family had to report and register themselves. Tags identified families and luggage alike. Suitcases stretched, filled with entire family histories and traditions. Tarpapered barracks and a landscape of dust and sagebrush welcomed the first arrivals to Minidoka, remembered one internee at Minidoka. The executive order only required the most basic essentials be provided. The camp itself was kept in better condition than many other camps of the sort. 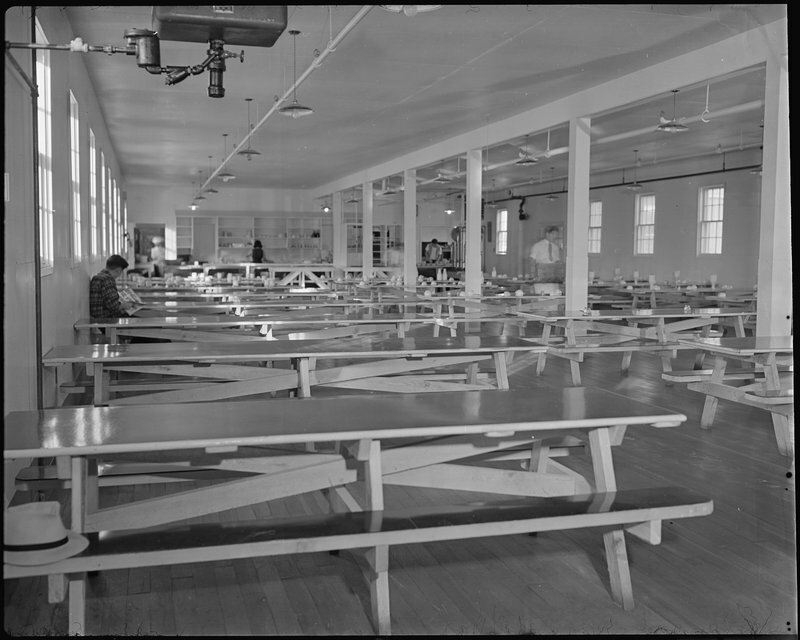 It served as a pseudo-town, with a small governing body (comprised of military personnel), two elementary schools, a high school, a gym, a skating rink, many baseball diamonds, farms, livestock, stores, a hospital, salons, a library, a fire station, and various other types of employment. Internees generally got along well with their captors, though as the war continued, tensions rose as the reintroduction of the draft troubled many residents. Sports were popular to help relieve stress, especially baseball and basketball. 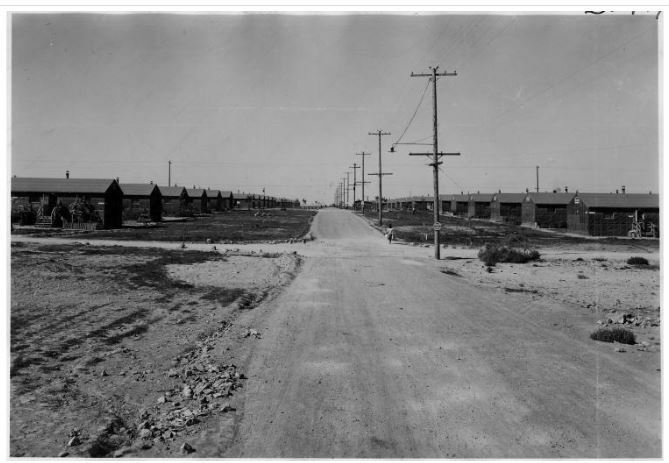 While not as luxurious as their previous homes, the Minidoka camp provided for most of the basic needs and the camp administration attempted to create an environment that still felt like a normal town. Suspicions festered and discouraged “enemy language” journalism. Paranoia surrounded any individual with Japanese heritage without regard to their civil liberties. To attempt a semblance of normalcy, the camp produced a weekly newsletter, the Minidoka Irrigator, to inform and update detainees on camp activities. Detainees performed weddings, graduation ceremonies and created their own sports teams inside barricaded walls topped with barbed-wire. War hysteria played a dominant role in the actions of camp authorities in charge of producing camp newsletters. Baseball provided a popular distraction, and helped to maintain a sense of normalcy in the unusual circumstance. Children attended school, often taught by people who had attended college, and teenagers graduated from high school. Adults worked and farmed, though almost always for much lower pay than the accepted minimum wage of the time. The internees farmed and tried to help end the agriculture shortage. Coupled with Mexican braceros, they comprised the majority of the labor force in the state of Idaho during the war. Most of the people living there were US citizens and had lived most of their lives in the U.S. This contrasted to the older generation, called the Issei, who felt betrayed and humiliated by the country that they had grown to love. However, the Nisei, the first-generation Americans, felt obligated to prove their loyalty by joining the armed forces when called to fight against the land of the fathers. Thus, in 1944, the War Department began the draft and allowed interned Japanese Americans to serve. Many of them would form the 442nd Regiment, which would become an “all Nisei unit.” 1,000 people from this camp served in the World War and 87 died in combat, representing one of the highest rates of service in the various internment camps and the highest number of casualties from all the internment camps. These soldiers generally served exceptionally, and were valuable assets to the US military corps. The end of the war eliminated the need for the camp, and it was closed on October 23, 1945. 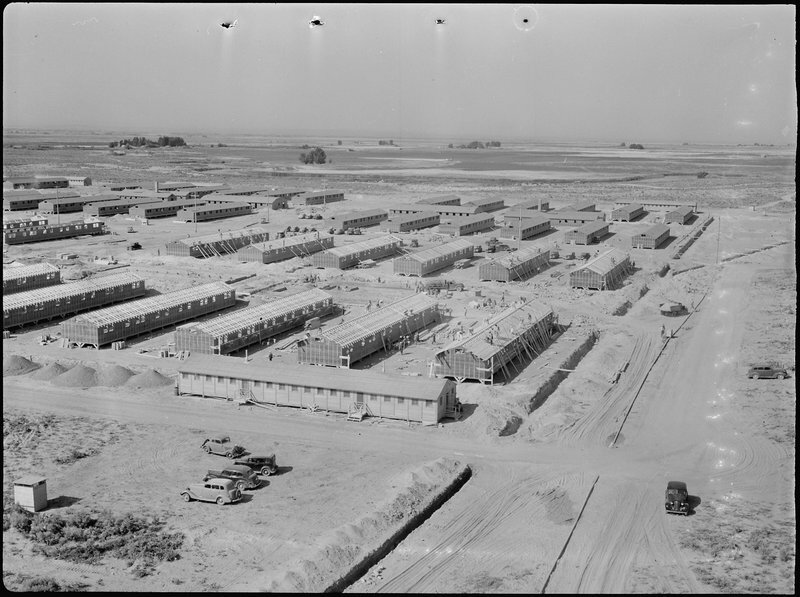 The government removed most of the buildings in the camp quickly, and the land was granted to returning veterans in a post war lottery. In 1952, the Soil Conservation District organized a “Farm-in-a-Day” experiment, designed to demonstrate the most efficient farming techniques and to create more interest by homesteaders in the surrounding farmland. The land was used mainly for agriculture for the next few decades before being remade into a historical site, recognizing the poor treatment of Japanese-Americans. Today, only a few remade buildings and some signs commemorate this episode in Idaho’s history. 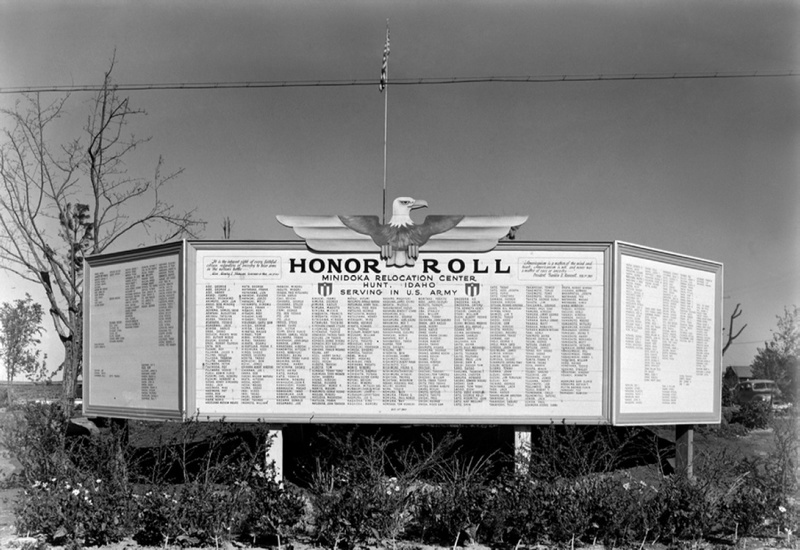 Minidoka Honor Roll: This is the list of internees who were serving in the US military during WWII. ~ Source: Owned by the War Relocation Authority. This is an encyclopedia of stories, interviews, and other resources on Japanese Interment. 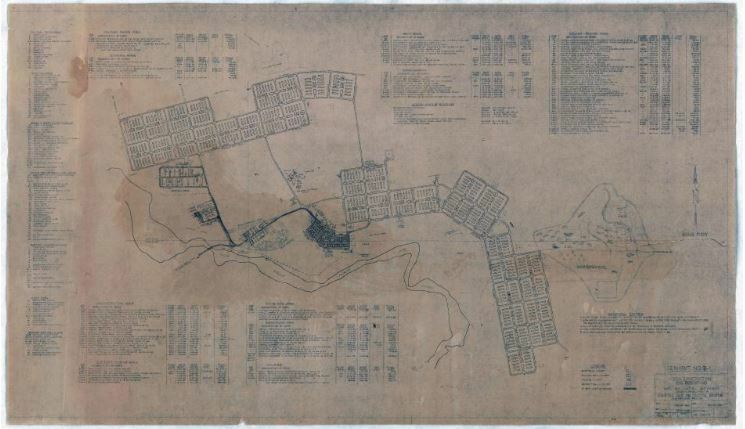 Kelsey Lavelle, Brigham Young University, “Japanese American Internment in the Minidoka Camp,” Intermountain Histories, accessed April 20, 2019, https://www.intermountainhistories.org/items/show/91.